Re:Mind’s first episode is kind of intriguing in setup, but doesn’t deliver a hook to necessarily push you towards watching more episodes. 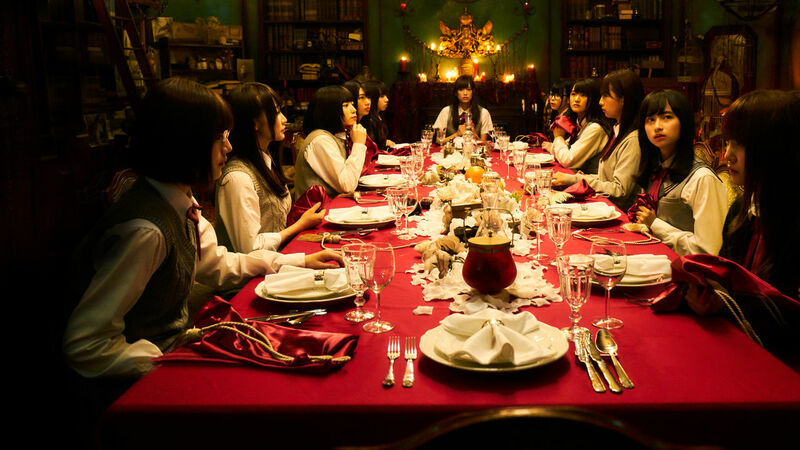 11 girls of a 20 person class find themselves at a Victorian dining table. All chairs, but one, are filled and each one begins the dinner with their heads covered and their ankles locked away beneath the floor. It is nearly midnight and we’re told the latest anyone can remember anything is around 5PM. Why are they all here? Well, supposedly something happened to Miho, the possibly missing girl, 3 months ago and according to Mao’s picture of a past get together they had, she is the only one who could be missing. Especially since they are in the exact same seats as they were before. Leading you to wonder, who set up this elaborate get together and was it just for the sake of it being the last day of high school? Is it time to pay the price for whatever happened 3 months ago before they can officially move on with their lives? Out of all the girls, the only one which sort of stood out to me was Kyoko. If only because she had a slight Aubrey Plaza vibe to her. But, in general, all the girls seem so similar look and personality wise, that you’d basically need a seating chart to write their names on to know who is who. I get that, so it seems, just one person is translating everything, but I wish Netflix would have that person do more than just the dialog. If there is a word or name on screen, translate that. Part of what makes it hard to know who is who is because the scenes where we see everyone and their name, it is kept in the show’s original language. So What Are You Being Punished For And What Could The Punishment Be? Which is fine, and to be expected in the first episode, but then comes the big issue: Why are these girls here and what will the punishment be? For a show like this, that’s the hook. Clearly, something happened to Miho that these girls likely covered up, but what happened? And even if they want to cover up their sins until later on, at the very least knowing what the punishment could be would build hype. For there just being a whole bunch of mice in the room, while traumatic in some ways, also doesn’t seem like the type of stuff you’d do if you shackled a bunch of girls’ feet into the floor. 13 episodes at about a half hour each, with a rather weak first episode. I feel like this show could be a struggle to get through unless in episode 2 or 3 things pick up. For just the overwhelming majority of the characters having no personality is a serious issue. So here is hoping episode 2 quickly finishes up the foundation so the show can build up to something interesting. While also making the character more than a bunch of screaming girls and Kyoko who seemingly has long been tired of sharing a classroom with these ladies.